I am so excited to share some photos of our shop’s Christmas line. 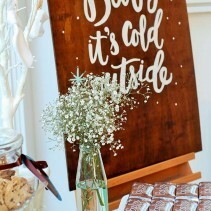 It’s been on Etsy for a little while now, but I really wanted to wait until after Thanksgiving to share it. Now it’s Christmas, so here we go! 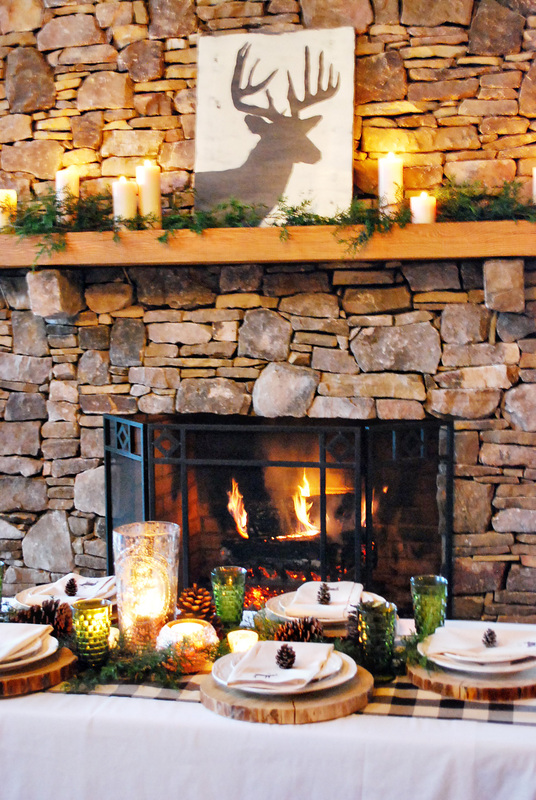 Our goal when we opened this shop was to create a fresh take on the season with our seasonal decor. For example, we wanted to bring in some traditional colors, but show them in a new way. 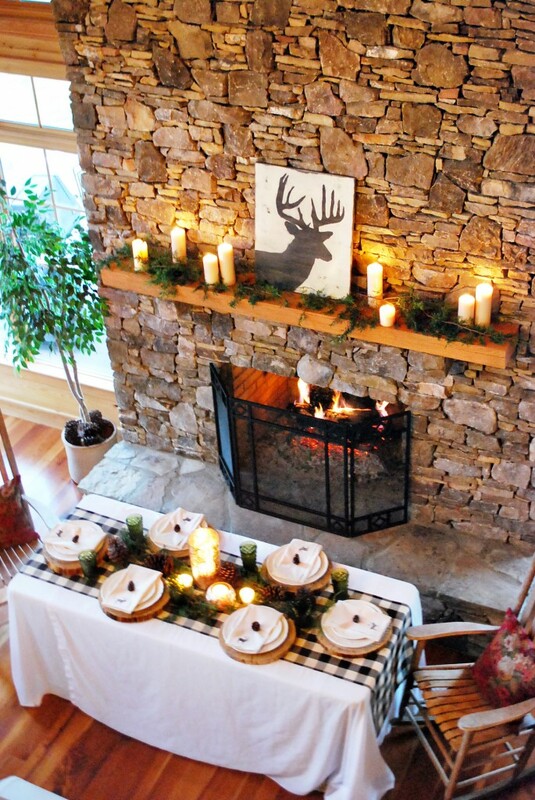 Or, change up the seasonal colors all together. 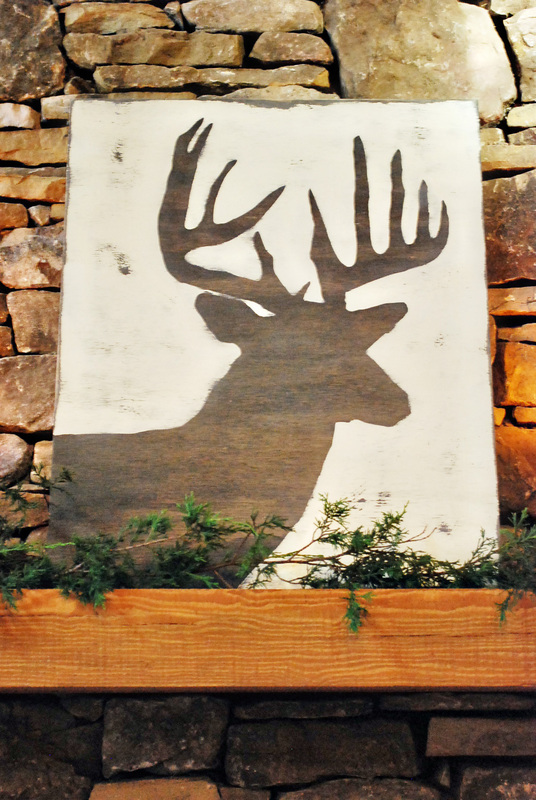 Our line was inspired by this deer head silhouette that we turned into weathered wall art. 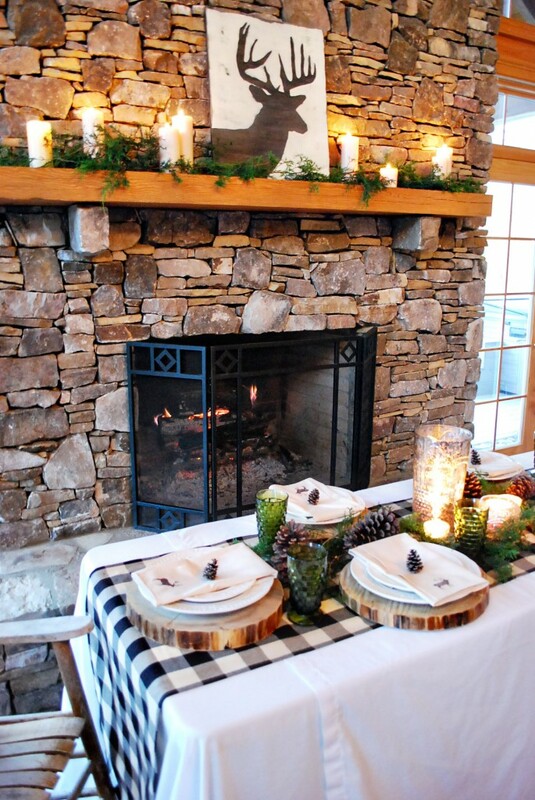 I love the masculine and rustic touch that this adds. 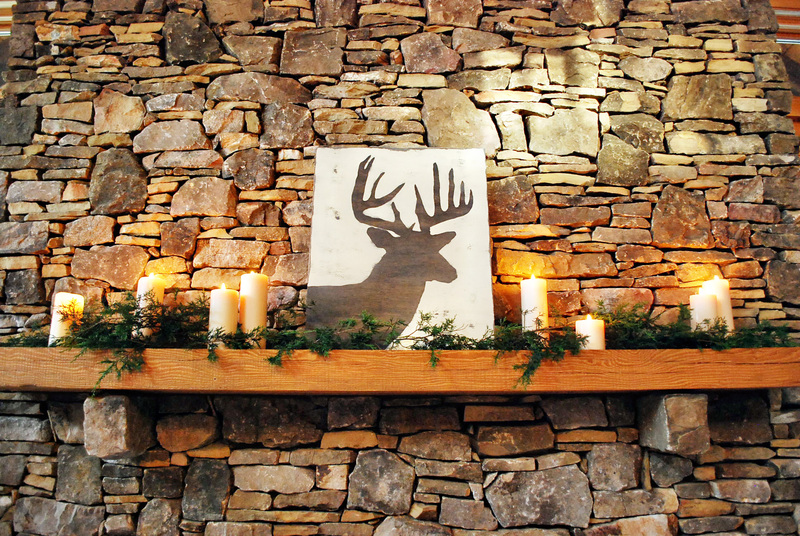 We love bringing in nature and a bit of simplicity for the seasons, so just a bit of greenery and candles made a seasonal mantel with this friendly little deer. We wanted a country lodge feel for this line, so my parents house was perfect to stage these pictures. I just love their fireplace. 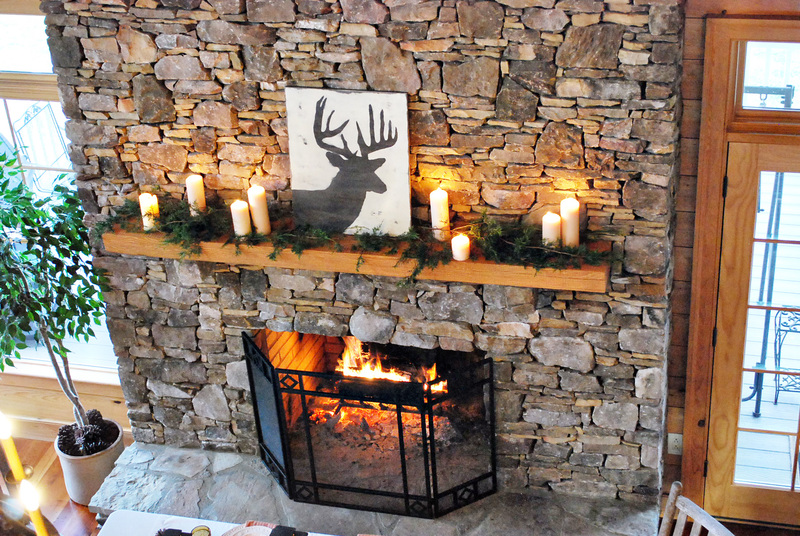 Nothing says Christmas to me like a roaring fire and burning candles. 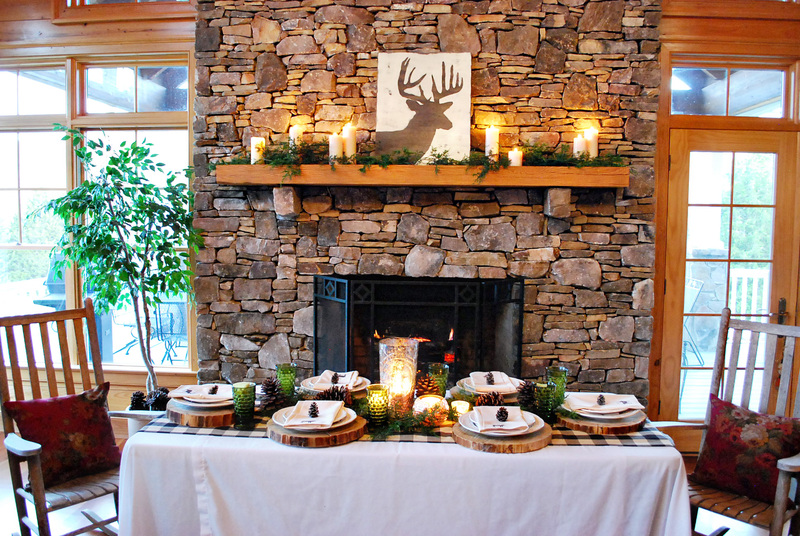 After developing the wall art, we knew we wanted some table linens to go along. We created two different looks. I’ll share the first one today and be back with the other tomorrow. 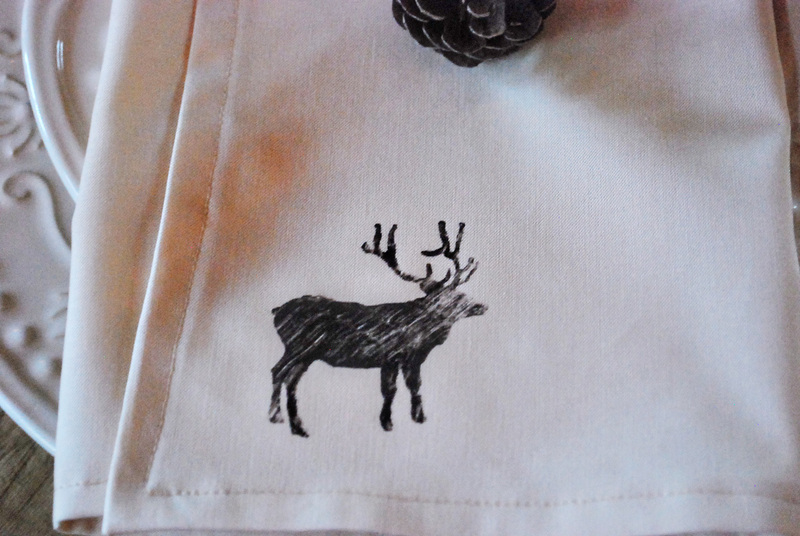 …and cream napkins with a handpainted deer on them. We wanted the paint to have a faded/vintage effect. We’re so happy with how they turned out. These napkins might be my favorite thing. 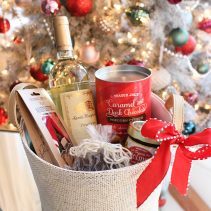 Our goal with this line was to create as many products as possible that would be perfect for the Christmas season, but could be used beyond that. 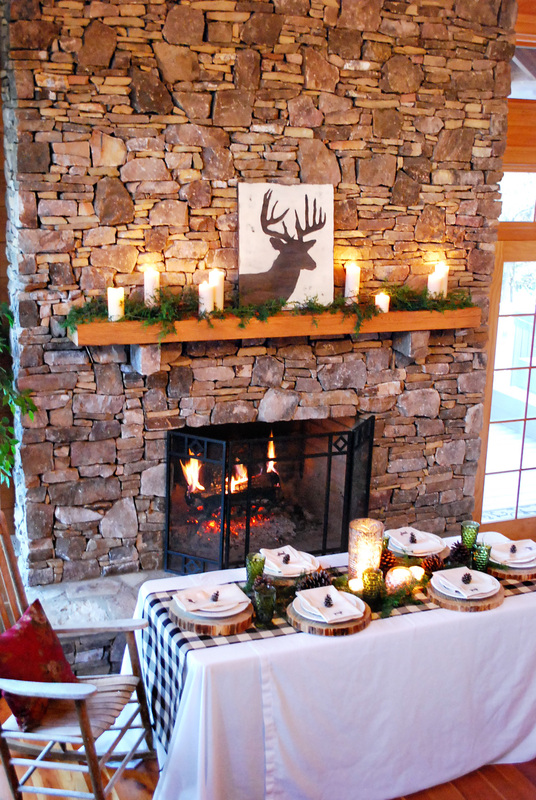 I know I’m going to have this deer head art and these napkins around for quite a while. 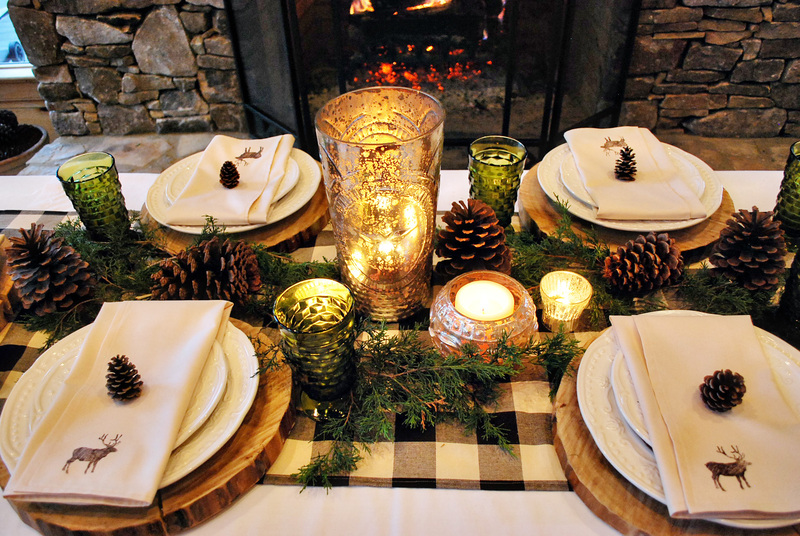 For the centerpiece, we brought in fresh greenery from a tree behind my parents house, large pinecones, and some mercury glass. You just can’t go wrong with mercury glass. 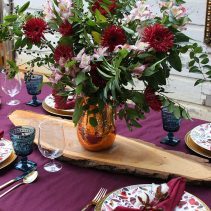 And just because these photos make me happy, here’s a couple shots of the whole table. Okay, I know that’s more than a couple, but I just couldn’t help myself! I’ll be back tomorrow with the other look and a REALLY EXCITING announcement that I’m so happy to share. The pictures look so great!! I love the cozy lodge feel it has. 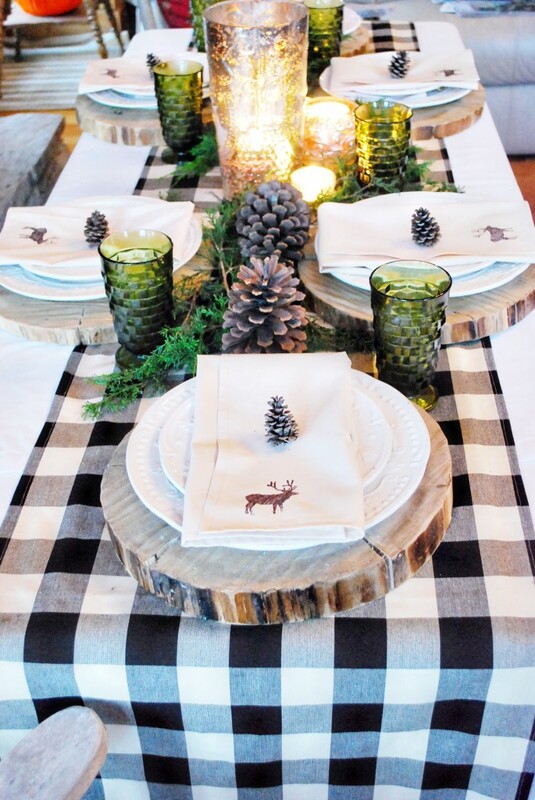 My favorite is the buffalo check runner. Great job!!! Wow, love this!!! 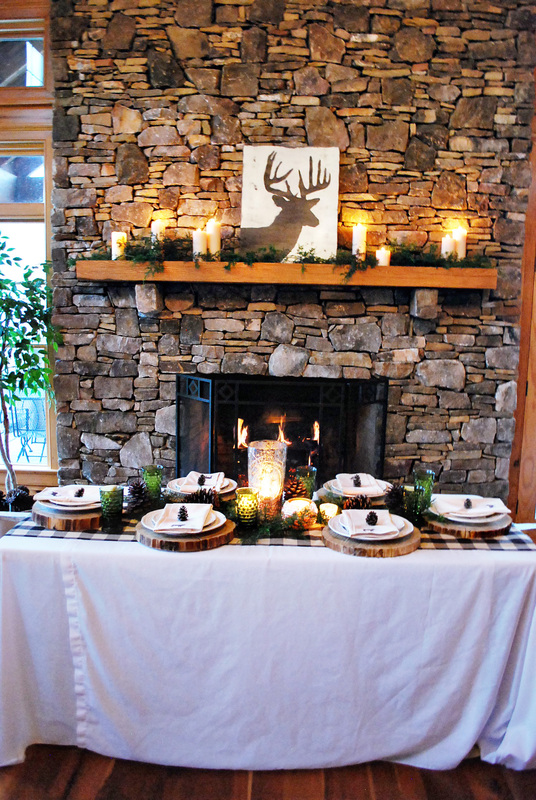 What a great combination of rustic things to make a truly elegant table and sitting area! I just had to show my followers too! 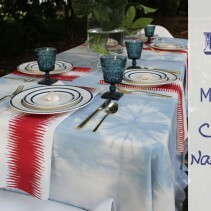 Any chance you still have these table linens? I can’t seem to find link to your ETSY shop. Hi Sara! I wish 🙁 We actually stopped the Etsy shop two years ago because it just became too much with the blog :\ I hope you can find something similar! 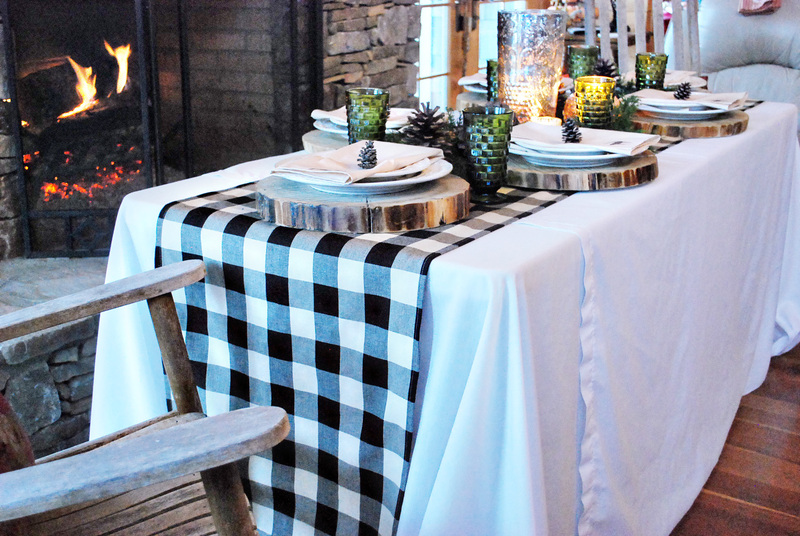 We got the Buffalo Check fabric from Hobby Lobby. 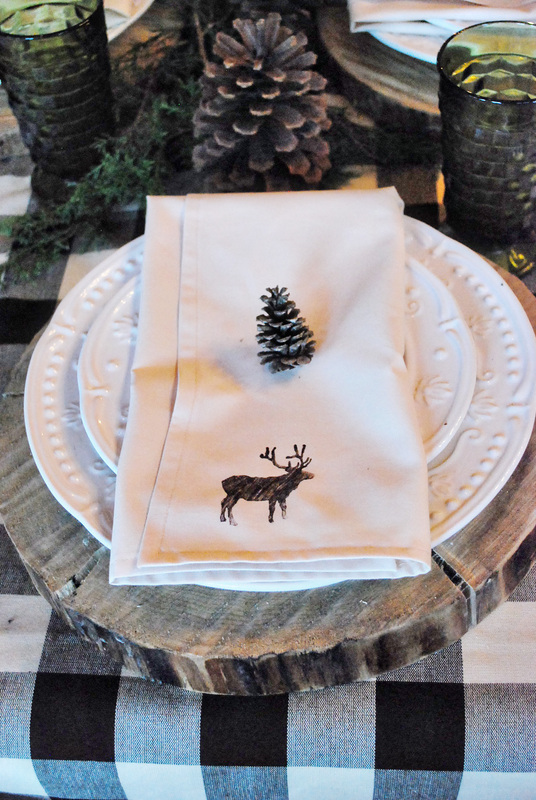 The napkins are muslin fabric from Hobby Lobby and we stamped the deer on using a stamp from Hobby Lobby (use black paint and textile medium). Maybe you can make your own!! Love the dishes, where did you get the dishes? 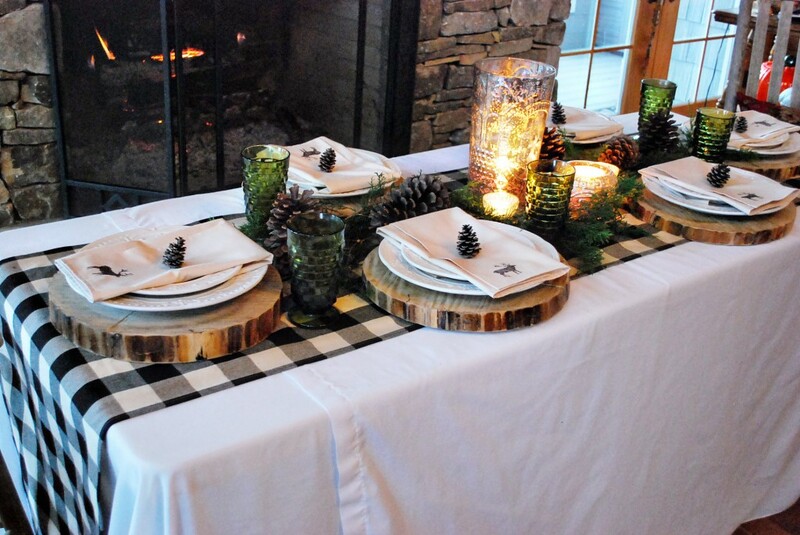 I just stumbled across this post and saw you don’t have your Etsy shop anymore, but I’m definitely going to try to diy the table runner and napkins. Did you make your wood chargers or did you purchase those somewhere? Thanks so much!